On one of my infrequent trips to London, I managed to miss the last cheap day return train back to Cardiff and therefore had a bit of time to kill before the next cheapie (well comparatively speaking) train. As I would not be getting back to Cardiff until gone 9pm I decided on dinner as the best way to while away an hour or so. 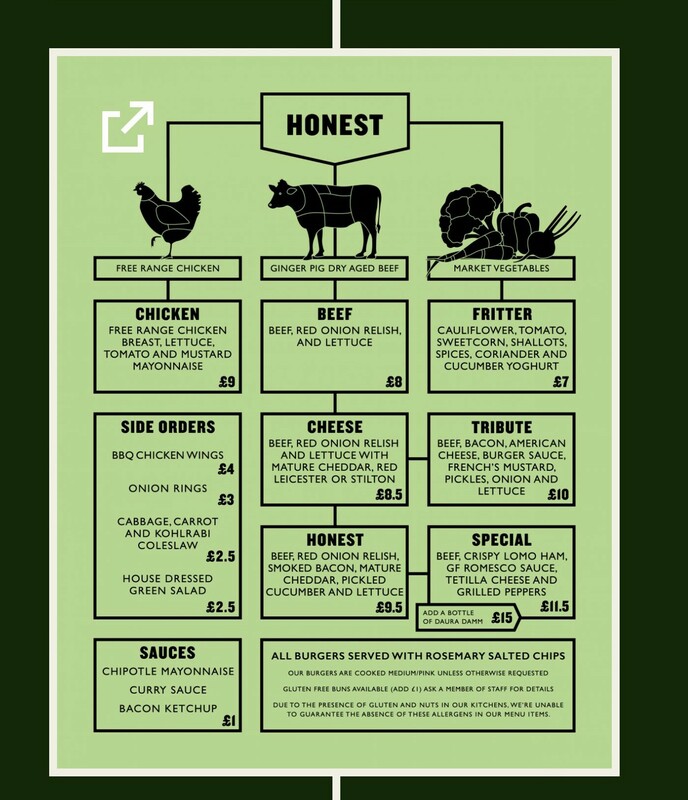 I have been keen to try Honest Burgers, a small London based chain with branches across London, for a while and this gave me the perfect excuse. According to Google Maps, the Oxford Circus branch was pretty much exactly half way between my firm’s offices in London and Paddington Station. It, therefore, made for a convenient stop off prior to getting a later train. I imagine that rents in central London for commercial space are eyewateringly high, especially for retail space just off Oxford Street. This means to pay your bills either your prices have to be high or you have to sell a lot of stuff. Honest Burgers eshews the former, so must sell an awful lots of their burgers to make any money. I suspect that they do exactly that as their burgers are really rather good. It took me a while to find it as I have a new phone (my old one having imploded and unilaterally defaulted back to factory settings) which I am still getting use to and which resulted in me causing much tutting on Oxford Street as I dithered in the main flow of pedestrian traffic trying to work out which way to go using Google Maps. How people stand Oxford Street is beyond me – it is a constant seething mass of humanity which makes me long for the more sedate pace of Cardiff. 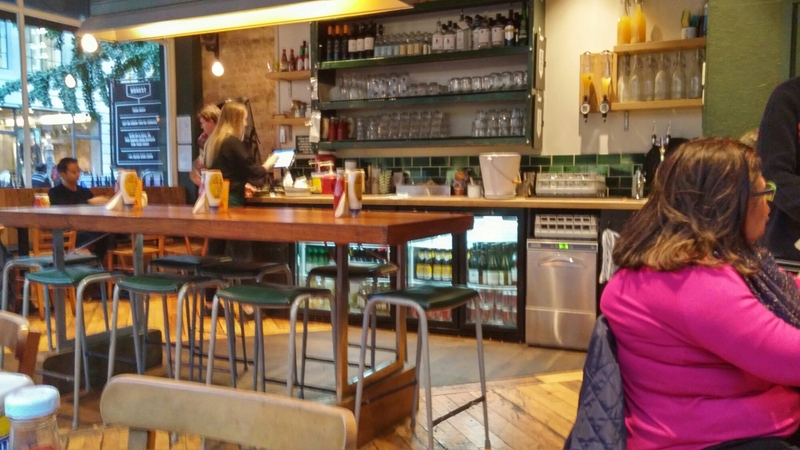 Honest Burgers (once I eventually found it) is located on a street corner just off the main Oxford Street drag and is reasurringly down to earth with seemingly no need for gimmicks to draw in the crowds. Inside it is a nice space, trendy but not achingly so and therefore I didn’t feel too out of place. Music was playing (I would prefer it not to be, but I am a bit of an old fuddy duddy), though not at the ear bleeding volume levels of some places. I like the simple menu which makes it easy to pick your burger of choice and side(s) to go with it. All the option seemed to me to be good value with burgers (all coming with chips in the price) ranging from £8 for the basic beef burger to £11.50 for the special. Veggies are also catered for and it is nice to see a cheaper price (£7) for the veggie option. Sides (I didn’t indulge) looked good and again were nicely priced (£3 for onion rings, £4 for BBQ chicken wings). 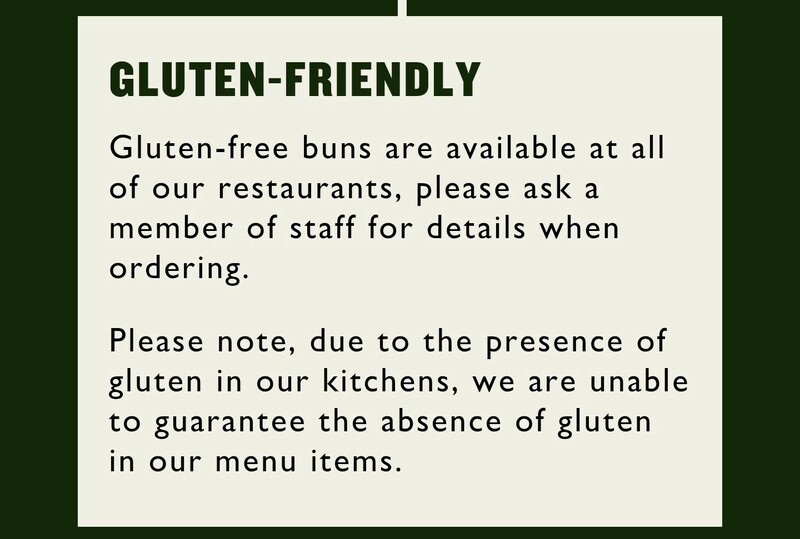 They also do gluten free buns and burgers and I overheard the manager explaining, in some detail, this offering to a family whose child had a gluten intolerance. Saying that, methinks a lawyer wrote the piece below – classic giveth with one sentence and taketh away with the other! I decided on their signature “Honest burger” which consisted of a bioche bun, red onion relish, cheddar cheese, smokey bacon, pickled cucumber, lettuce and of course a beef pattie. Now you know you are on to a good thing when the menu refers to dry aged beef from that wonderful purveyor of fine meat the Ginger Pig and on seeing this I started to salivate. I was asked by the waitress how I would like my burger cooked and what arrived was a perfect medium rare as requested with a nice bit of pink inside. Sorry no inside picture of the pattie. I though I had taken one but seems not (technophobe with new phone is not a good combo I fear). The burger was a fine looking beast and the pattie itself had a great texture (holding together, but being wonderfully giving as I bit in to it). The meat itself was moist and juicy and had a lovely beefiness to it (can’t really go wrong with Ginger Pig meat). The accompanying cheese, bacon and pickle worked really well with the flavoursome meat. The whole shebang held together well enabling me to grab the burger, squeeze it and stuff it into my gob without it disintegrating. If I had one criticism it would be that the red onion relish and the bioche bun made it a little bit on the sweet side for me. It was nice to see that all their burgers come with rosemary salted chips as part of the price. These were a good sized portion and had a nice hit of rosemary. Again a slight criticism was that they were not absolutely piping hot and the rosemary did operate to dry out my mouth a bit. As a result I was quite thirsty by the end, especially after I had hoovered up the crispy scraps. This brings me neatly to the drinks menu. 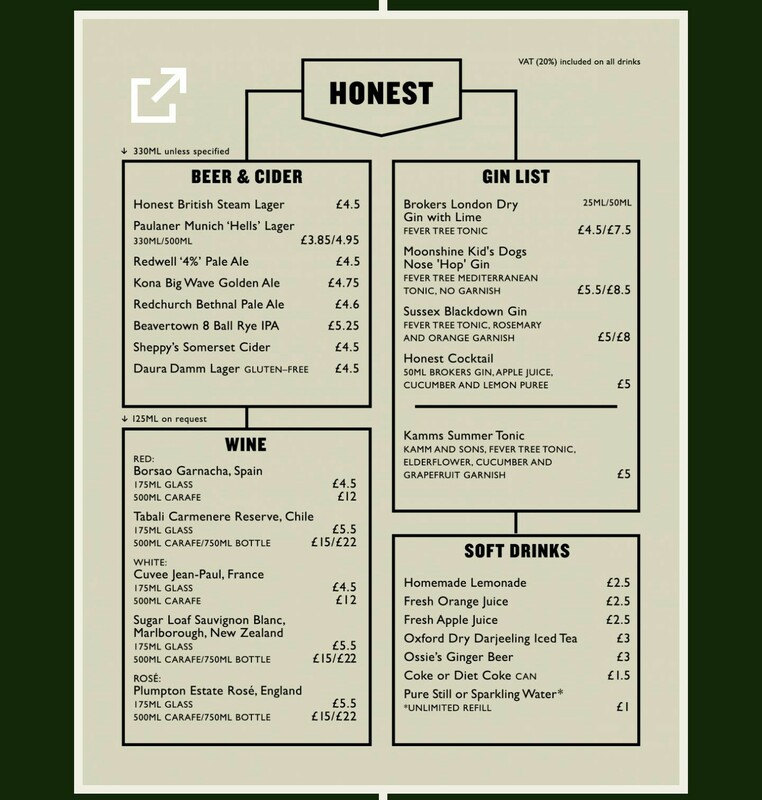 This encompasses some nice craft beers and a short but well chosen wine list (anywhere that has Borsao Garnacha as its house wine offering – a great value Spanish red – gets a big thumbs up from me ). I also like the fact that they sell wines in 500ml carafes as well as by the glass and the bottle. That intermediate 500ml carafe size (nicely priced at £12 for the Borsao) is perfect for two people and a burger meal. 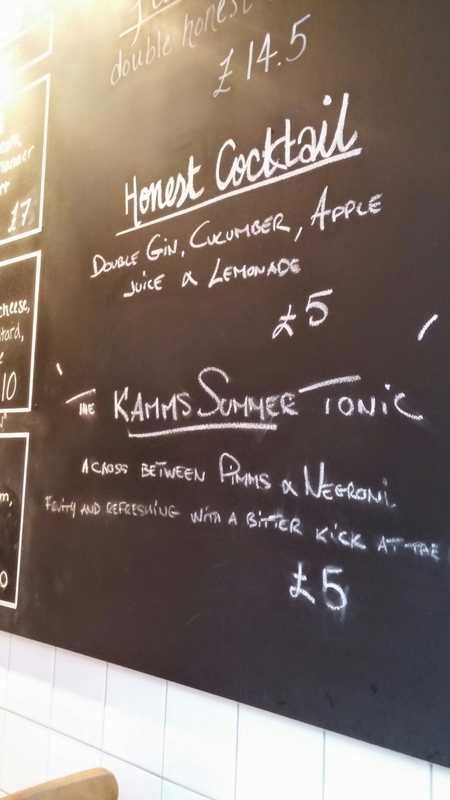 They also have a fine selection of gins and cocktails on offer, with the latter looking particularly good. 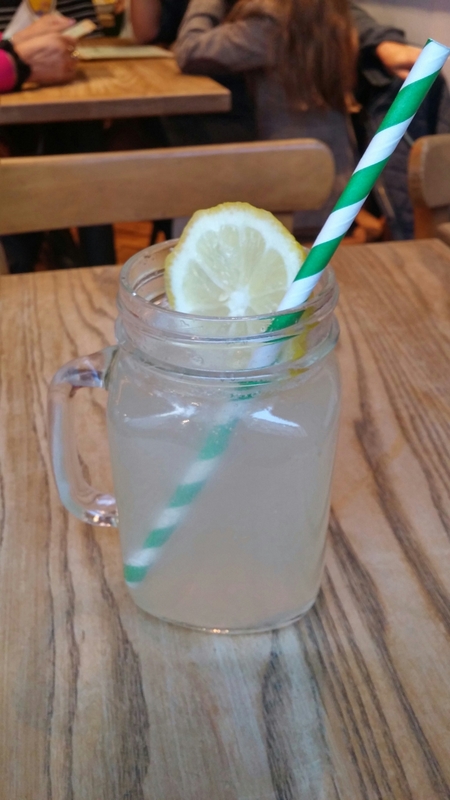 I regrettably was driving later on that evening so no booze for me, but I had a very refreshing homemade lemonade (£2.50). This had just the right balance of sweet and sharp and was the business in quenching my rosemary induced thirst. 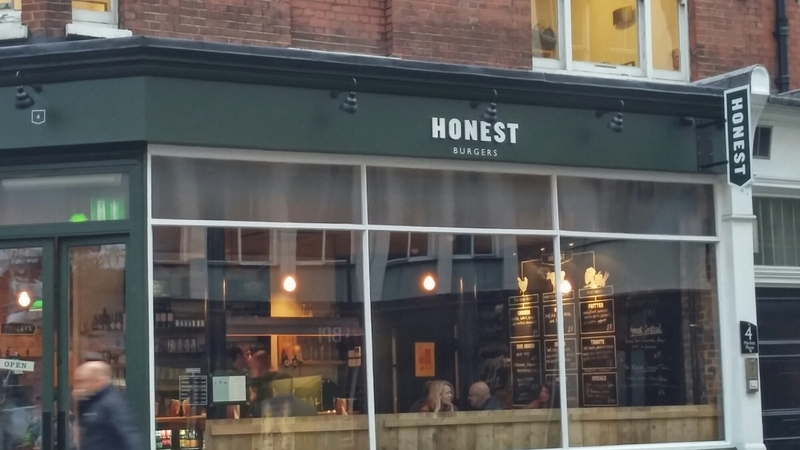 I really liked Honest Burgers. Good food and drinks which are nicely priced and a chilled out vibe made for a happy hour or so for me. The burger was very good with excellent quality meat. 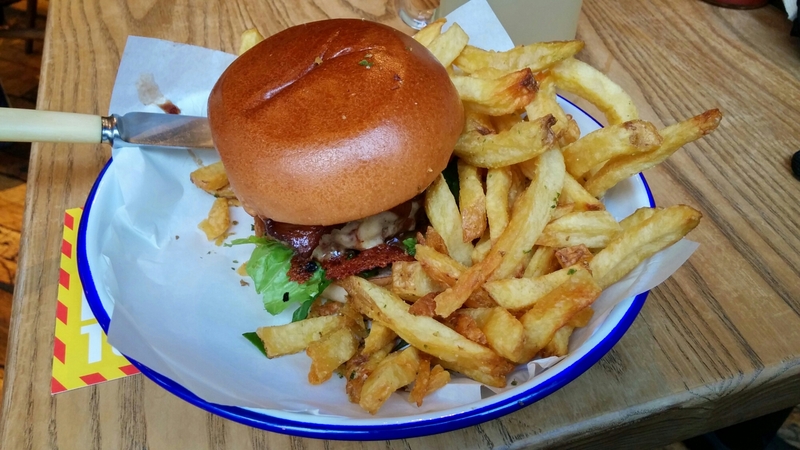 If not quite up to the standard of my benchmark burger, the Dead Hippie, it is certainly close to the top of my list. Other locations in London are in Brixton, Soho, Camden, Portobello, Kings Cross and Tooting. 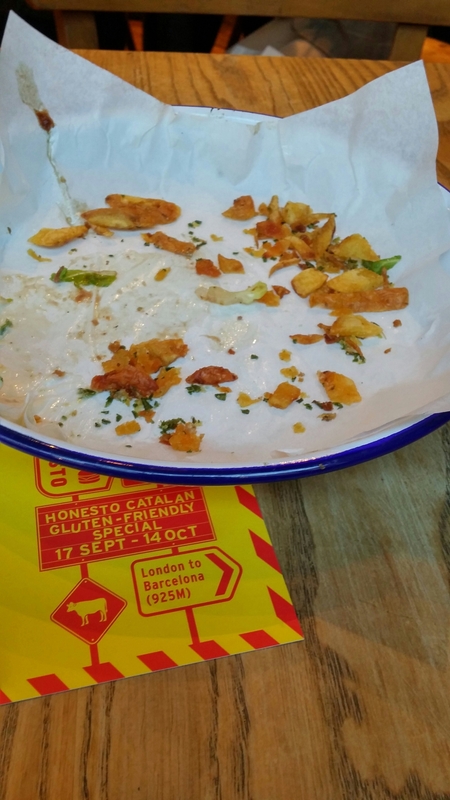 This entry was posted on Oct 26, 2014 by solicitingflavours in Burger, Drink, Food, Food and wine products, london, Non alcoholic drink, Restaurant Review.